While some media outlets feel that “citizen journalism” or user-generated content is diluting or cheapening the practice of journalism, others see it as a rich source of eyewitness reporting about breaking-news events such as the Boston bombing or the war in Syria. As a recently released report from Columbia’s Tow Center for Digital Media points out, however, many of the latter group routinely fail to say where or how they got the content they make use of on their evening news broadcasts, or give any credit to the individuals who created it. As the study’s authors describe, some of this is because of a lack of structure in newsrooms or established processes when it comes to user-generated content — but some of it also stems from a cultural tension between professional journalists and “citizen” journalists or amateurs. The Tow study was put together by Claire Wardle, formerly a staffer at Storyful — a company that tracks and verifies user-generated content for large media entities, and was recently acquired by News Corp. — and fellow media researchers Sam Dubberley and Pete Brown. 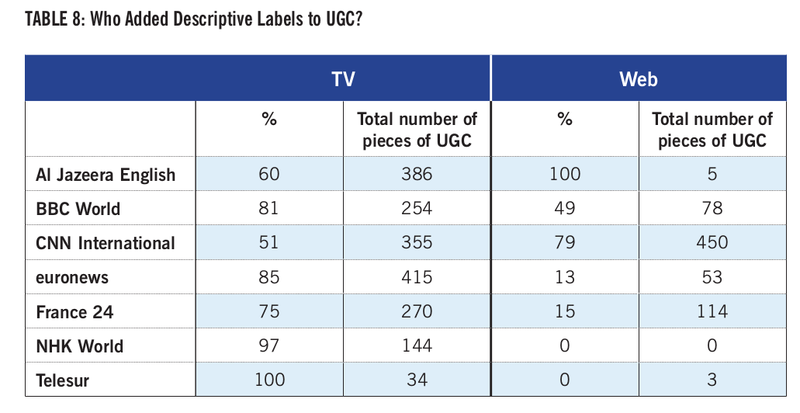 The team released the first phase of their research in April, which was a quantitative look at how much UGC was being used by traditional broadcast outlets, and just released the second phase on May 30. As Storyful founder and CEO Mark Little is fond of saying, many media companies seem to think that crediting a video to YouTube or a photo to Instagram is sufficient, even though this is a little like crediting a news report to “the telephone.” One of the things that Storyful tries to do, — in addition to verifying where and when a piece of content originated — is to help the original creator maintain their rights to the video or photo, and potentially even monetize it by selling access. The second phase of the Tow Center’s research was more qualitative: Wardle and her team interviewed senior executives, reporters and editors at 38 news organizations based in 24 countries, and asked them how they approach the use of “citizen journalism” or eyewitness reporting and what kinds of processes they have in place to verify and/or credit the original source of that reporting. Some organizations have their own UGC team — the BBC, for example, has a dedicated user-generated content desk staffed by about 20 people whose job it is to find and verify photos and videos from around the world in real time. Other outlets have a small group that focus on doing so, while some smaller organizations rely entirely on agencies such as Reuters or AP to come up with footage, and in many cases don’t even know the original source (according to the report, Reuters often only supplies a credit that says “social media website,” while AP supplies as much info as it can). 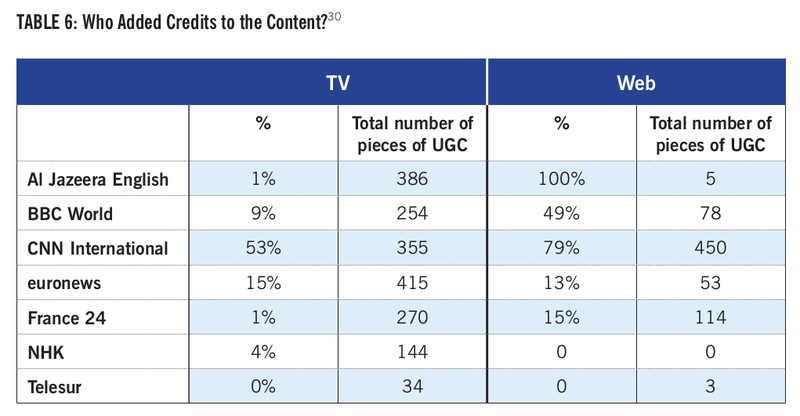 As the report goes on to note, viewers are thought of as potential sources for breaking news content once the newsroom has been alerted to a story, but “the audience is not often considered a partner in producing compelling content… this tension will continue to impact discussions about UGC, and it is unsurprising that it runs throughout this research.” In other words, many media companies still see users as faceless suppliers of content for them to use in whatever way they wish, rather than as true collaborators in a journalistic exercise. The Tow report also notes that many newsroom managers are still unaware of the technical or legal complexities involved in the everyday work of discovering, verifying, and clearing rights for UGC and “consequently, staff in many newsrooms do not receive the training and support required to develop these skills.” The report’s authors point out — as Storyful’s Mark Little has on a number of occasions — that this kind of approach could easily lead to a class-action lawsuit by UGC creators against media outlets that don’t provide credit and/or payment. The really silly thing about expressed fears is that this doesn’t lessen work for journalists at all…it creates much more, even if roles may be evolving. As to “the crowd” being better than the individual, that’s as it should be. Perhaps journalism is evolving into something more perfect as it goes through these growing pains. Journalists who care about truth and accuracy should put their egos aside and view it through that lens.